A Maytime Hare - GIVEAWAY! Before I launch this jolly (late) springtime giveaway please bear with me as I gently urge you to find yourselves some rhubarb and a small pot of thick sour cream to make this cake - it is truly scrumptious and holds the taste of spring in my opinion. I am mighty glad to have carved out this precious corner of time from the organised havoc of guitar concerts, relentless choir rehearsals, theatre performances, seven music exams (for a ten-year old), final dance shows (for my imminent school-leaver) and the long stretch of Baccalauréat examinations which have triggered as many outbreaks of eczema for Héloïse as the stage make-up she's been using. Most of it is uplifting stuff although I would be lying if I said that voices were rarely raised in our home and sleep never broken. Keep stitching, baking and walking, I say. And a few chuckles and belly laughs in between the stress-ridden moments work wonders too! 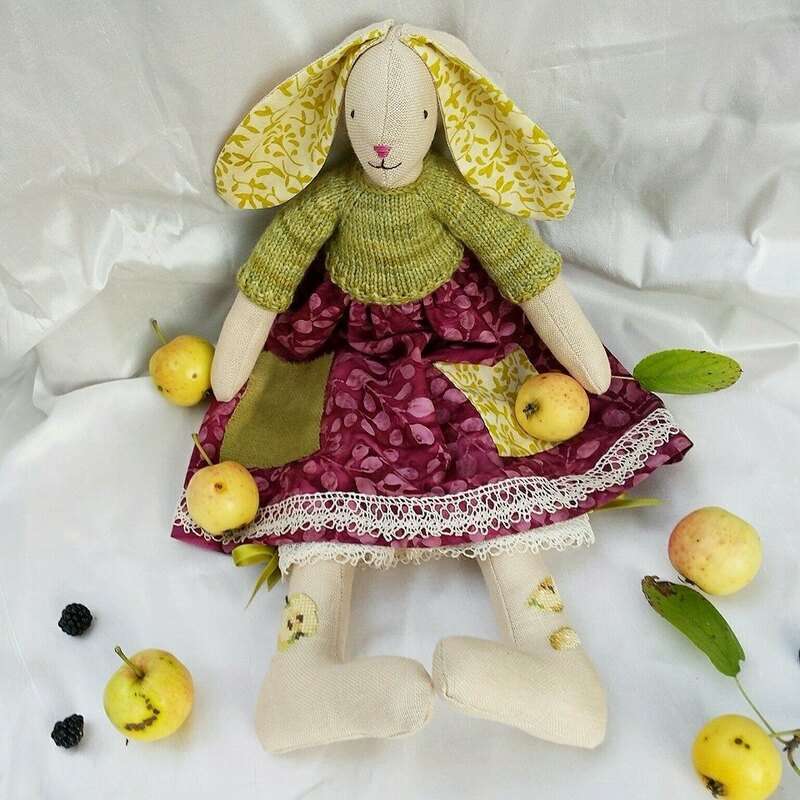 I am delighted to introduce you to Spring Chick my latest limited edition hare created specifically to celebrate almost three years of blogging, nurturing precious friendships and sharing inspiration with like-minded folk. This little lady is most definitely a nod to the kitsch and a tad quirkly. She is a Mistress of Flowers clad in early morning glimpses of patchwork fields of brilliant yellow oilseed and creamy lady's lace (just look at those bloomers!) The month of May in our parts is usually terribly rainy and so very verdant - a hundred shades of green. My favourite is a cross between pea-green and parrot-green; both of which feature in the Liberty fabric dress. If I close my eyes for a moment I see garden festivals, held between sunny spells and rain clouds, cakes being baked and eaten with clotted cream. I see the white flowers of strawberries, and a colourful riot of columbines and foxgloves. Part of me, however, is holding onto the movable feast of Easter with its entourage of early spring flowers; hence the two chicks perched on each hare limb. I could go on and on... You know that, don't you? Antique French creamy lace and tulle, spring flowers on a new Liberty print, bright pink satin ribbon, gold-threaded 1950s ric rac and perky chicks. Like her or hate her she's one of a kind! So, if Miss Spring Chick tickles your fancy there are THREE ways to win her and you can try all three ways to give yourselves a little extra luck. First, all you have to do is to leave a comment at the end of this post. Everybody is welcome regardless of where you live or whether you are a regular reader of Millefeuilles. For a second chance, if you wish, you can SPREAD THE WORD about this giveaway on your blog or put a link in your sidebar. Please feel free to choose the picture your prefer for that. Finally, if you are on FACEBOOK, there is a post about this giveaway on my page which if you LIKE and SHARE will give you ANOTHER chance to win. Don't forget to leave another quick comment here once you have done the deed to let me know. This giveaway will close on Tuesday June 10th and I will be using the Random Number Generator to pick the winner. I'm afraid the macarons are NOT included in the giveaway. There are currently sitting in our fridge! ps I have decided to announce the winner of the Salley Mavor Giveaway on June 10th, too. This way I will be making one trip to the post office with two parcels instead of one. Three actually. It seems that more than a handful of you have been misled into believing the giveaway was a book instead of a beautiful poster. I could not resist, therefore the urge to purchase a brand new copy of Mavor's book A Pocketful Of Posies - a feast of artistic inspiration - which I will be offering, together with the two posters, to the winner. pps The book featuring in the very first picture is Vic Brotherson's Vintage Flowers which was generously gifted many moons ago by Annie over at Knitsofacto. Sorry Gaspard. Those macarons are not for you either. Before leaving for Paris this weekend to spend time with my family I am squeezing in a post after almost a month's silence. Although the season for wild violets came to a close early April in our corner of France I have been cultivating my love for these tiny blooms with hand-dyed threads and a beautifully-penned book. In a recent post of mine, also dedicated to violets, the author Kathy Leonard Czepiel wrote a comment gently suggesting I read her debut novel A Violet Season (published in 2012). It took me two minutes to order it and two evenings to devour its two hundred and fifty odd pages. I recall my primary school master decades ago urging us not to judge a book by its cover but his cautionary words flew out of my head when I set eyes on this pretty cover. Fortunately, in this case, this book is both beautiful without and within. It is also hard and frank; a dark tale of a hardscrabble life set in 1898 on a violet farm Upstate New York. Leonard Czepiel's carefully researched and constructed novel carried me back to the turn of the twentieth century and kept my senses alive with every page I turned. It is a finely-written tribute to late nineteenth-century women's endurance which has put in check my daily and trivial grumbles. The booming violet industry provides a sensual backdrop to the dashed hopes and drudgery of most women who must endure the sometimes heartless decisions and subterfuge of their menfolk and teaches the reader how hardy both violets and women can be. It is also a book delightfully stuffed with details of the everyday life of over a century ago. Glimpses of city life provide a counterpoint to the Fletcher family's rural existence. Household chores, Christmas traditions - violets were grown over winter, not spring - and one of the early sewing machines makes an appearance too! I will not share the storyline of A Violet Season with you but I will say that a woman's relationship with her daughter is damaged (beyond repair?) as they both make dreadful sacrifices for their family's survival. And the violets in the first picture above? They are a work in progress from Blackbird Designs (I purchased the sampler chart, linen, and threads from here ) and the perfect complement to my recent reading. The violets are stitched on Iced Cappuccino hand-dyed linen from R & R Reproductions with Weeks Dye Works floss in River Rock, Stepping Stone, and Stone colourways. 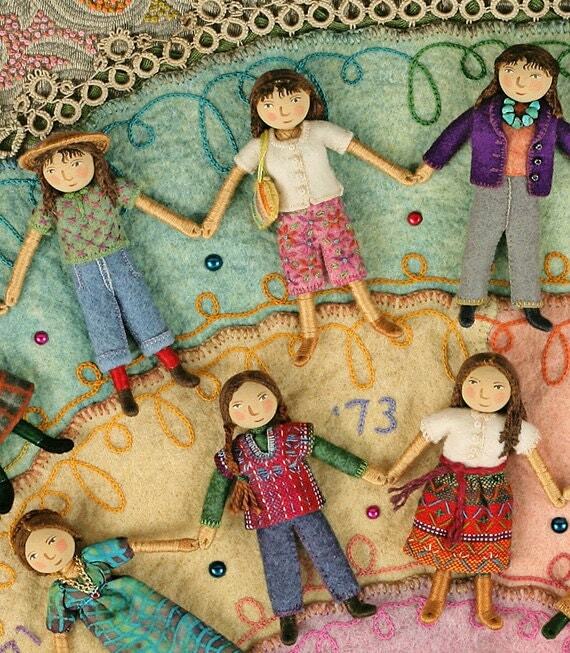 Finally, in a desire to feed Angélique's overwhelming enthusiasm for Nursery Rhymes two years ago I stumbled across Salley Mavor's stunning textile artwork through this book. I recall showing it to my mother on one of her visits to our home and she too was in awe of this amazing artist's attention to detail and the rich colours she uses. A few weeks ago I purchased a signed copy of Salley Mavor's Self Portrait: A Personal History of Fashion. I was touched to receive a second copy, also autographed, which I decided with the artist's approval, to send as a gift to one of you. 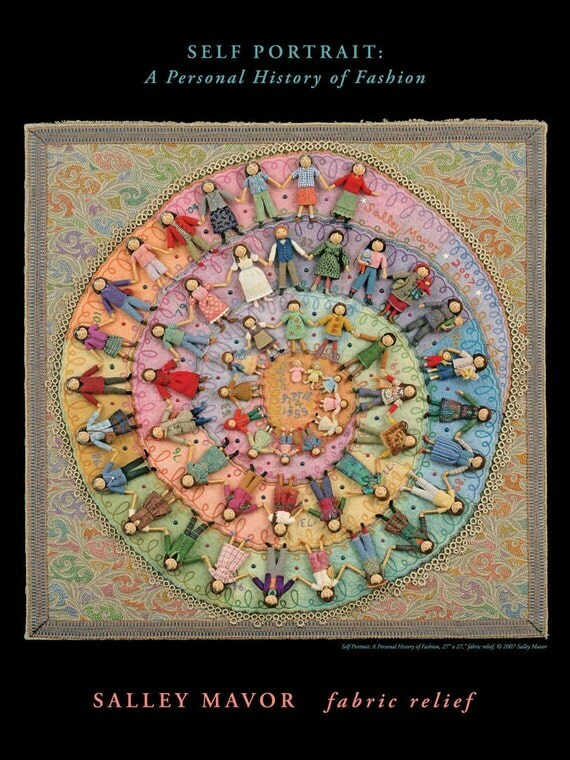 This fabric relief sculpture incorporates miniature dolls which represent each year of the artist's life; each one is hand-stitched and displays a wealth of details of fashion over the past fifty years. If you are interested in receiving a copy of this work of art together with a poster of Mavor's beautiful Blossom Fairies please leave me a comment below. I will announce the winner in just over a week. I hope you are all well and happy. I dedicate this post to my American friends who are finally enjoying violets after a long winter. I have the pleasure of joining in with Laura's May version of The Year In Books. ps BE WARNED! To celebrate (almost) three full years of this small blog of mine there will be a Spring Hare Giveaway on my next post. She is blooming, kitsch and cheery in equal measures!